What has my slacker self been doing? This flu really knocked me for a loop – and I haven’t felt at all creative about writing. There are MANY unfinished posts hanging out in the Drafts section waiting to be ready. But rather than bore you with something potentially silly or rush the process, I have stayed rather quiet. Hope you understand. Here’s what I’ve been doing recently. Reading this book in preparation for seeing the much-lauded Hamilton on Broadway with Ms. Moxie. Before you get too excited, we’re going in NOVEMBER. Waiting is hard. Particularly given that my friends are always posting about it. 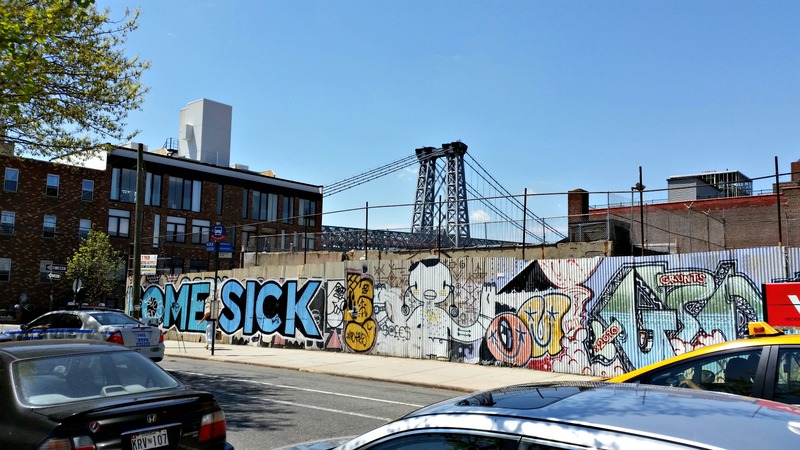 This entry was posted in etc., Music and tagged apartment hunting, brooklyn, Empellon al Pastor, flu, Hamilton, michelada, moving, nyc, real estate, tacos, tequila, williamsburg on March 27, 2016 by onechicklette. Last Sunday, I played apartment hallway baseball with NeighborKid. I had a minor hangover and was wearing the boot. Truthfully I just wanted to go back to bed with a pillow over my face. But she was so happy to play that I kept pitching and she kept hitting. After all, I’m moving soon so I won’t have many more moments like these. When I moved into this apartment, NeighborKid was two and a half years old. More baby-like than kid often. 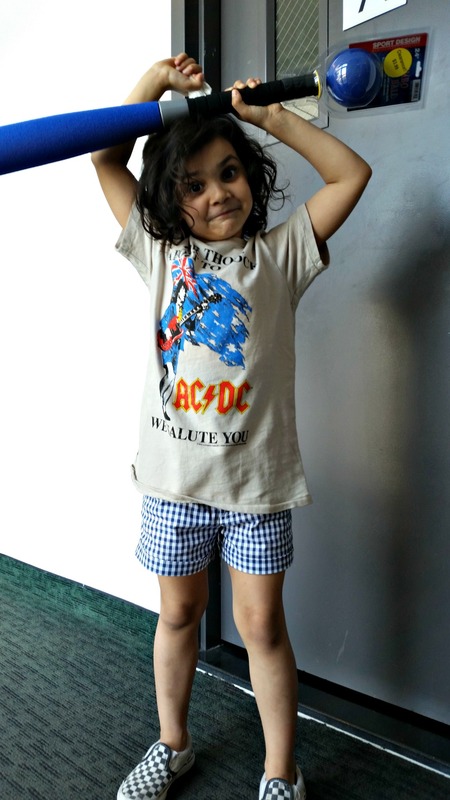 She had a sometimes challenging personality (her parents would agree!). But now, she’s fun and silly and I’ll miss her. 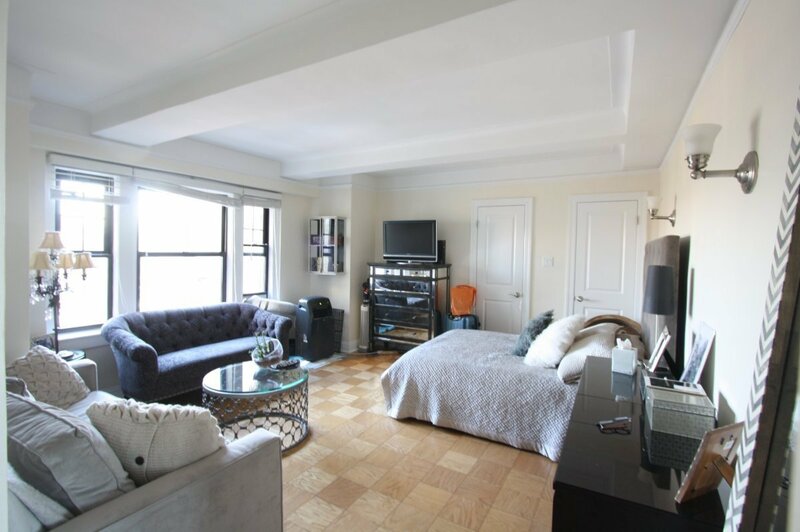 This entry was posted in NYC and tagged Apartment, brooklyn, moving, NeighborKid, nyc, real estate, williamsburg on May 20, 2014 by onechicklette. I’m moving on up…to the Northside of Williamsburg, that is. At the end of May, I’ll be moving approximately seven blocks from where I presently live to a much larger apartment I’ll share with my friend Katie. One bonus: my rent is going to go down by a LOT. Another bonus? There’s a washer dryer in the apartment. This is a big deal in NYC. 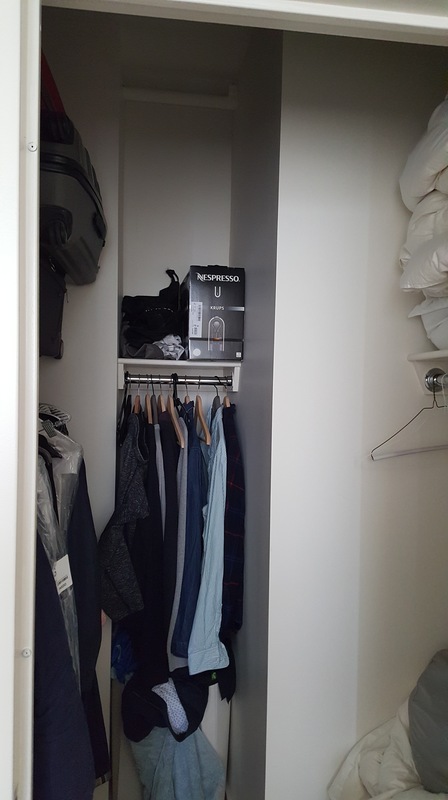 When I told my mother that I am moving, it was clear to me that she hoped it would be to a Manhattan apartment. Sorry, Mom. 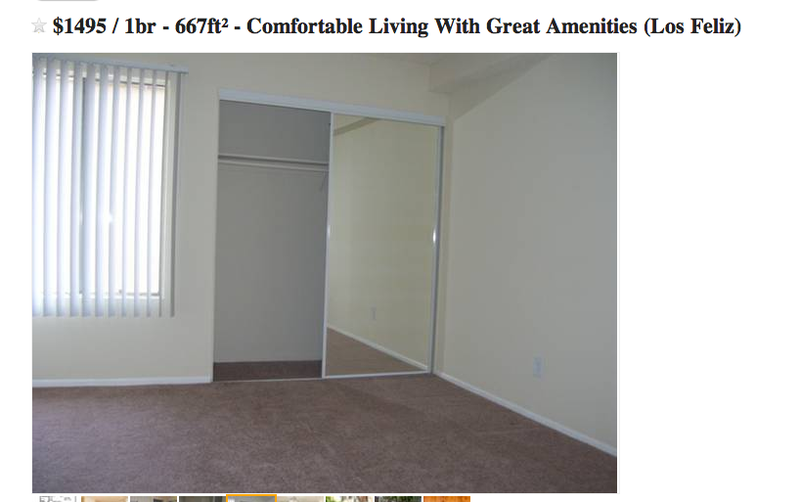 I like Williamsburg and here I can afford a much, much nicer apartment than in Manhattan. The only thing I’m not excited about? Packing. Ugh. This entry was posted in NYC and tagged Apartment, brooklyn, moving, nyc, real estate, rent, williamsburg on May 13, 2014 by onechicklette. 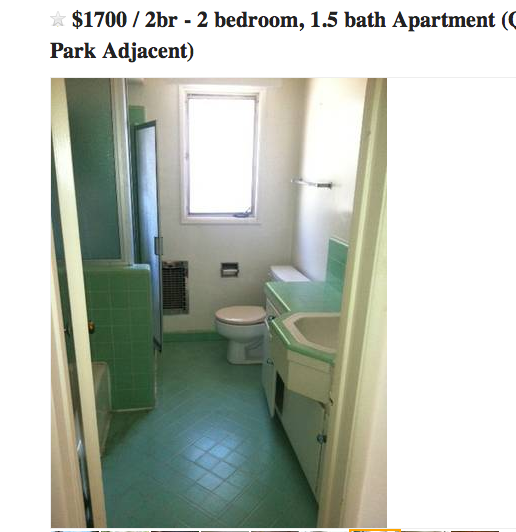 I thought NYC had a lock on weird apartments. Craigslist will prove otherwise. 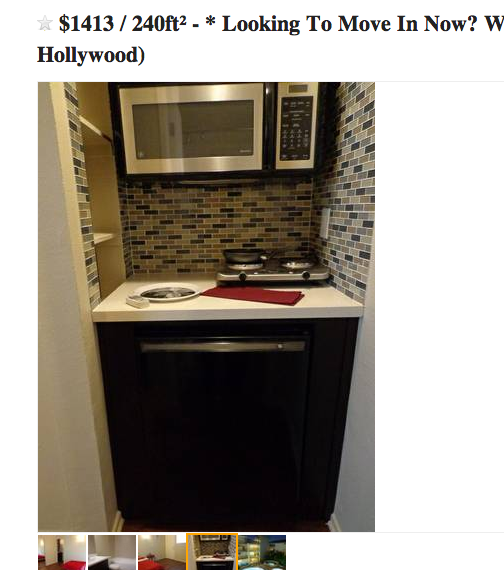 I give you a small selection of Los Angeles‘ rental oddities. This is the extent of the kitchen. 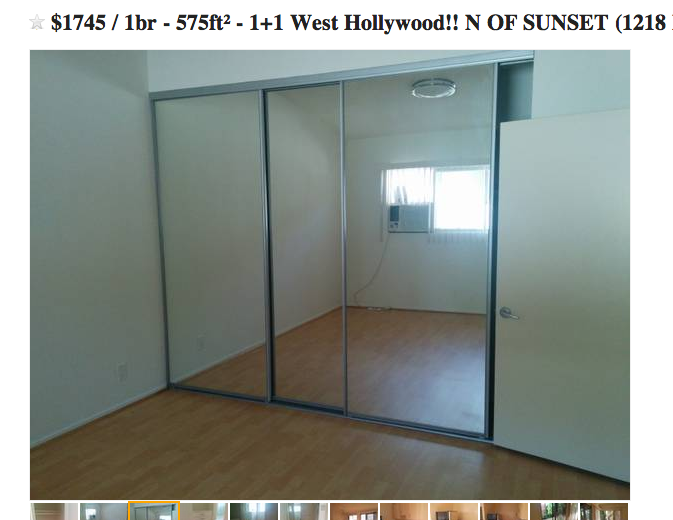 Like in New York, you can find sad window air conditioner units reflected in mirrored closets. Just to be clear, I’m not moving to Los Angeles. It’s true that LA is one of my favorite places and I look forward to my trips there. Every time I’m there, I wonder what it would be like to live in LA. This entry was posted in etc. 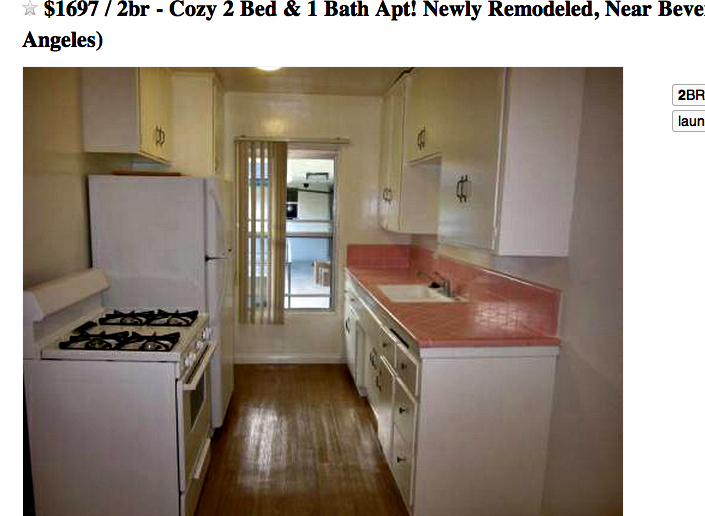 and tagged Apartment, city living, LA, los angeles, pink, real estate, tile, ugly on January 9, 2014 by onechicklette. 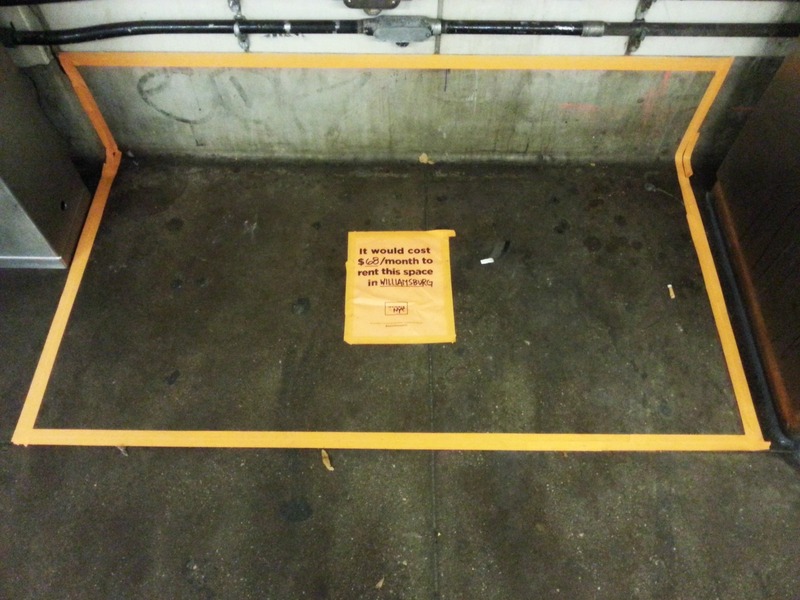 Someone taped off a few square feet in the Bedford Avenue L train station and noted that the market rent for this little space would be $68 per month. This entry was posted in NYC and tagged awareness, brooklyn, high cost, homeless, homelessness, New York City, nyc, poverty, real estate, subway, williamsburg on December 1, 2013 by onechicklette.